Documents used during the City Council’s deliberations over MIH earlier this year. As residents seek to determine how much affordable housing will be created in each rezoning neighborhood, they are quickly becoming familiar with the city’s new Mandatory Inclusionary Housing policy, commonly referred to as MIH. Mayor de Blasio, with City Council approval last March, made the policy mandatory, requiring that developers benefiting from an upzoning make a percentage of units permanently affordable to families at specified income levels. The policy is expected to produce at least 12,000 of the 80,000 below-market units that the administration seeks to build over ten years. While some lauded the new policy for ensuring new housing projects include a baseline of affordability, others have said the percentage and income level of the affordable units will fail to create sufficient units for the most low-income families. Many also object to the administration’s strategy of upzoning low-income neighborhoods to create rent-restricted housing through MIH, arguing that this introduces a large percentage of market-rate units to these neighborhoods and worsens gentrification. Yet the administration is quick to point out that the policy can also serve to create affordable housing not only in rezoning neighborhoods, but any time a private developer in any part of the city applies for an upzoning. For such an important tool, it’s a complicated one to understand. 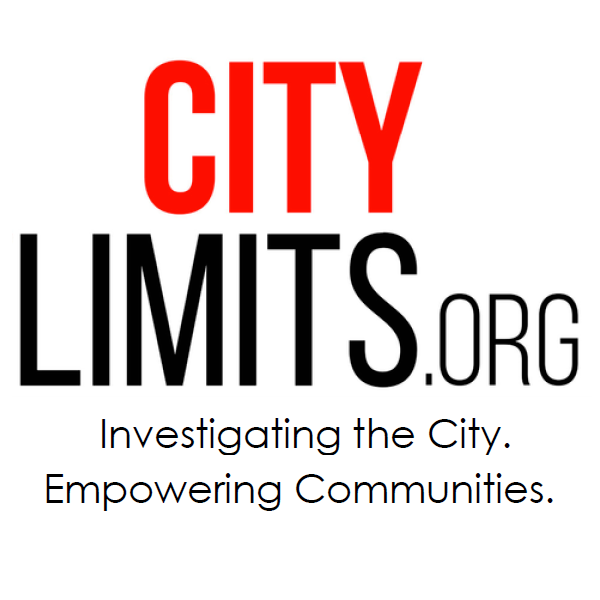 City Limits has broken down some of the gritty details of how the policy works, as well as what has been said so far about the kind of projects the policy will produce. When must developers abide by the rules of MIH? MIH applies in two situations. First, say a developer wants to build a bigger residential building, expand an existing residential building or convert a non-residential building to apartments, but is not permitted under the current zoning. They can apply for a rezoning, but if the project will include the creation of more than 10 units, or the creation of more than 12,500 square feet of floor area, the developer is required to follow the rules of MIH, ensuring a percentage of units are below-market. The policy applies to both condominium and apartment developers. MIH can also be triggered by a neighborhood rezoning initiated by a city agency like the Department of City Planning. If the rezoning would allow a “significant” increase in the permitted residential floor area for property owners, any developers building in that area in the future must comply with MIH requirements. The Department of City Planning decides what is “significant” on a case-by-case basis, and says it seeks to balance its goal of creating MIH areas with its wish to create a favorable environment for housing development. It’s important to note that MIH doesn’t apply whenever a residential building gets larger. Sometimes a building is smaller than the zoning allows, and the owner is already permitted to build it bigger; at other times, an owner might purchase the “air rights” of a neighboring building, which also permits them to build a larger building without a zoning change. Only when there is a zoning change, resulting in an increase in the allowable floor area, does MIH apply—as was spelled out in the discussion of a controversial project this summer. That project involved a development company, Acuity Capital Partners, that applied for a special permit to forgo the landmark regulations that disallowed it from taking advantage of the full floor area permitted under the existing zoning. While Borough President Gale Brewer said that Acuity should abide by MIH rules in exchange for receiving the permit, the City Planning Commission ruled that MIH did not apply because the developer was not asking for a change in the existing zoning. City Council approved the special permit, without requiring MIH, in October. Developers can also apply to the Board of Standards and Appeals for reductions of the MIH requirements if they can argue that there is “no reasonable possibility that a development, enlargement or conversion…will bring a reasonable return.” The Department of Housing, Preservation and Development (HPD) is required to submit a comment or testify before the board on whether they think the developers’ request is reasonable. Some advocates feared that many developers will take advantage of the loophole, but so far no developers have applied for a waiver of the requirements, according to a City Limits search of the BSA database. How much affordable housing, and affordable to whom? MIH revolves around four potential sets of affordability requirements. When approving a neighborhood rezoning the City Council and City Planning Commission decide which options will be on the table in a particular neighborhood. By custom, that means the local Councilmember will set the MIH standards that apply in a rezoning within her or his district. If more than one option is presented in a particular neighborhood, however, it’s up to the developer to decide which option to use when building within that rezoning area. And in the other scenario where MIH applies—the rezoning of a single property—the applicant, whether it’s a developer or a city agency, gets to pick the option they’ll use. Option #1 requires that 25 percent of units are affordable to families making an average of 60 percent AMI, or $48,960 for a family of three. A unit is considered affordable when rent and utilities costs no more than 30 percent of a family’s monthly income (or, in the case of condominiums, when total monthly fees and payments cost no more than 35 percent of a family’s monthly income). For instance, a family making $46,960 would pay roughly $1,200 a month, plus utilities, for a two-bedroom apartment. Because the policy requires the rent-restricted units to serve families making an average of 60 percent AMI, that means there can be units affordable to families making more, and making less, than that income level. Option 1 actually requires a mix: At least 10 percent of the total units must be set aside for families asking an average of 40 percent of the Area Median Income (AMI) or $32,640 for a family of three. There can also be rent-restricted units affordable to families making between $48,960 and $106,080. Option #2 allows developers to set aside 30 percent of units for families making an average of 80 percent AMI, or $65,250 for a family of three. Such a building can have a mix of income levels, and no rent-restricted units can be targeted to families making more than $106,080. For both Options #1 and Options #2, developers are allowed to use public funding to finance the projects. Option #3, known as the Deep Affordability Option, requires that 20 percent of the rent-restricted units be affordable to families making 40 percent AMI, or $32,640 for a family of three. This option was created by City Council to provide units for families making lower incomes, and developers cannot use public funding unless they are providing additional affordable units. Option #4, which cannot be applied in the core of Manhattan (community districts 1-8), requires that 30 percent of the rent-restricted units are affordable to families making 115 percent AMI or $93,840 for a family of three, with required percentages at several different income bands. Developers using the Workforce Option cannot use public funding. It’s notable that Option #3 and #4 cannot be selected by themselves—they must be selected alongside one or both of the first two options, respectively or both at once. Because a developer is allowed to choose which among the various selected options to use, that means that it’s impossible to require a developer to choose the Deep Affordability Option, and if a developer promises to use that option to secure City Council’s approval, there is no legal mechanism to hold them accountable to that choice. In prior interviews with City Limits, however, Department of City Planning, representatives argued that the Deep Affordability Option, which requires fewer rent-restricted units overall, might be no less appealing to developers than Option 1. Also, if a developer takes advantage of a small upzoning that results in the creation of between 10 and 25 new units, the developer is permitted to pay into an affordable housing fund in lieu of creating rent-restricted units. This fund, administered by the Department of Housing, Preservation and Development, must be used for the “development, acquisition, rehabilitation, or preservation of affordable housing” in the community district in which the project is built. If the funds are not used in 10 years, the funds can be used in any community district of the same borough. Are developers allowed to build “poor houses” next to luxury skyscrapers? 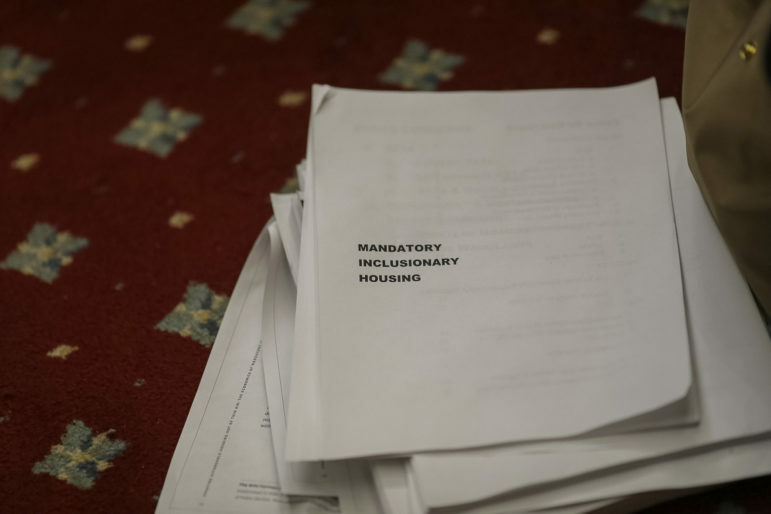 MIH was crafted in the midst of an uproar about “poor doors”—the provision of separate entrances for high- and low-income tenants in luxury apartment buildings. The de Blasio administration and City Council tried to craft MIH to ensure future projects did not stigmatize low-income residents. If the market-rate and below-market units are within one building, MIH requires that all units share a common entrance, with rent-restricted units distributed across 65 percent of the building’s floors. HPD has also amended its design guidelines to require that all tenants, regardless of income level, have access to the same building amenities, such as laundry rooms. In the past, developers have shown interest in fulfilling their low-income requirements by creating a low-income building offsite where the location may be not as favorable, and the price of land is cheaper. MIH allows developers to build off-site in the same community district or within a half-mile of the project, but disincentives this practice by requiring an extra 5 percent of rent-restricted units. Where has MIH been applied so far? So far, City Council has approved one neighborhood-wide MIH rezoning. In April, parts of East New York and Ocean Hill were rezoned with MIH requirements to promote greater densities. All future developers in this area will be required to abide by either Option 1 or the Deep Affordability option. The city is considering mapping MIH in nine other city neighborhoods across the five boroughs—and residents can read about the ongoing negotiations in these neighborhoods at City Limits Zone In. Most of the private-applications that have resulted in MIH designations have come from affordable housing developers. La Central and MLK Plaza in the South Bronx, and One Flushing in Queens, are all 100 percent rent-restricted projects that will provide some permanent affordable housing under MIH, as well additional, time-limited affordable units using a mix of subsidies. In the Rockaways, the city ensured that an upzoning granted to a hotel company included an MIH designation in case the hotel decided to flip the property to an apartment developer in the future. A project called Sherman Plaza, in Inwood, would have been the first MIH project to include a mix of market-rate and affordable units, but was shot down by City Council in August. According to the Department of City Planning, there are three more MIH projects very close to approval, including a luxury apartment building in downtown Brooklyn at 141 Willoughby Street, and two 100 percent rent-restricted buildings in the Bronx. There are also eight other projects that are currently undergoing public review. These include two market-rate buildings with affordable units in the West Village and Bedford-Stuyvesant, a Red Hook apartment building of only 10 units that has agreed to pay into the affordable housing fund, and five 100 affordable housing developments in upper Manhattan, Brooklyn and the Bronx. Though affordable housing projects, many in outer borough neighborhoods, make up the bulk of MIH applications so far, the de Blasio administration is hopeful that the policy will soon have the intended effect of generating an abundance of rent-restricted units in wealthier areas. Their success may depend on the fate of the 421a tax credit that Governor Cuomo is working to revive. * Correction: This paragraph initially indicated that Shiffman and Davidoff had pioneered the idea of mandating income-targeted housing for developers who wish to enjoy the full benefits of an upzoning. A reader pointed out that, in fact, the idea had made its way into city policy in the 1970s. But the planners we name were instrumental in making the concept part of the city’s first, broad affordable-housing construction and preservation effort, the Ten-Year Plan launched by Mayor Koch. NYC zoning is so complex that we need more articles like this to understand it. Not everyone in the East Harlem neighborhood feels they were part of crafting the East Harlem Neighborhood Plan, which welcomes development that many distrust. A group that helped draft the East Harlem Neighborhood Plan pushed for the city’s rezoning scheme to offer more housing to low-income people. A group that opposes any rezoning denounced both proposals. There are now two overlapping but distinct proposals for how to rezone East Harlem. The forum saw passionate argument over which plan, if either, is right for the neighborhood.